Americans are taking on a lot more debt. Total household debt climbed to $12.58 trillion at the end of 2016, an increase of $266 billion from the third quarter, according to a report from the Federal Reserve Bank of New York. For the year, household debt ballooned by $460 billion -- the largest increase in almost a decade. That means the debt loads of Americans are flirting with 2008 levels, when total consumer debt reached a record high of $12.68 trillion. Rising debt hints that banks are extending more credit. Mortgage originations increased to the highest level since the Great Recession. Mortgage balances make up the bulk of household debt and ended the year at $8.48 trillion. However, growth in non-housing debt -- which includes credit card debt and student and auto loans -- are key factors fueling the rebound in debt. 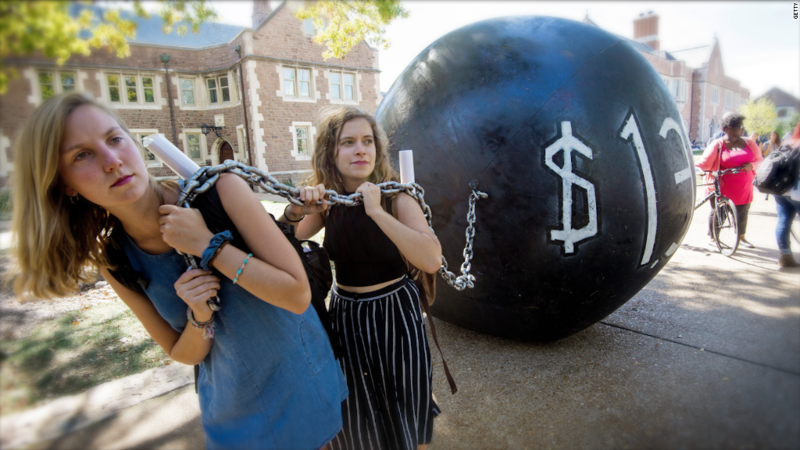 Student loan debt balances rose by $31 billion in the fourth quarter to a total of $1.31 trillion, according to the report. Auto loans jumped by $22 billion as new auto loan originations for the year climbed to a record high. Credit card debts rose by $32 billion to hit $779 billion. At these rates, the New York Fed expects household debt to reach its previous 2008 peak sometime this year. But while that may sound alarming, there is one big difference between now and 2008, according to the Fed: Fewer delinquencies. At the end of 2016, 4.8% of debts were delinquent, compared to 8.5% of total household debt in the third quarter of 2008. There were also less bankruptcy filings -- a little more than 200,000 consumers had a bankruptcy added to their credit report in the final quarter of last year, a 4% drop from the same quarter in 2015.